We have some wonderful orchards near our cottage and we love the fresh fruits that they offer. There are so many ways that we can enjoy fruit and one of our favorite recipes is grilled. Grilling fruit brings out the natural flavors and sweetness of the fruit. 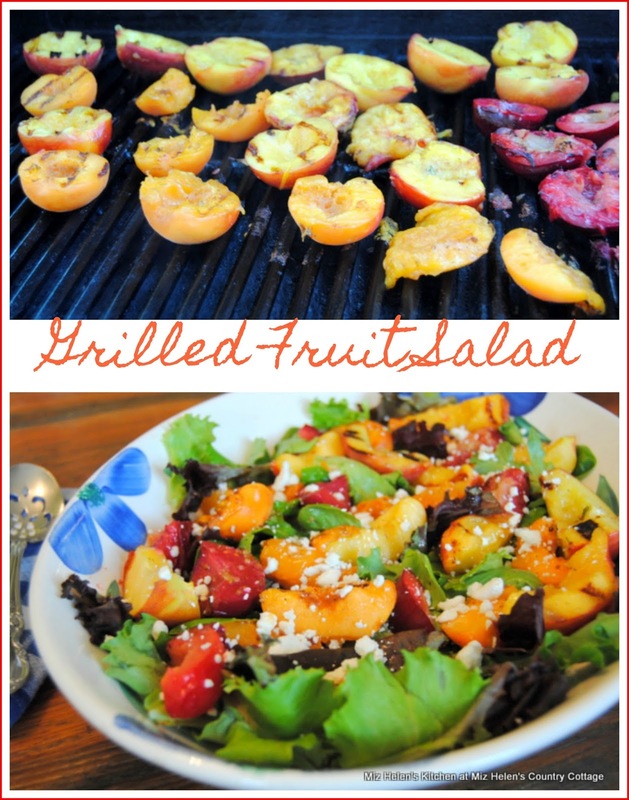 For this Grilled Fruit Salad recipe I am using the grilled fruit in this wonderful salad. I am using the lettuce from our our home grown lettuce, that we grow in our lettuce tub. The dressing for this salad is delicious and can be used with any salad. I sure hope that you have an opportunity to enjoy some fresh fruit and try grilling it for deeper flavor. Thanks so much for stopping by to spend some time with us, I always look forward to your visits. Have a fantastic week and come back to see us real soon! I've never thought to combine grilled peaches with grilled plums - looks beautiful and I bet it's very delicious. wow. Your salad looks absolutely delicious. I've never actually tasted grilled peaches but it looks like a great idea. What a great way to jazz up a salad! That looks so good. What a delicious idea! Thanks for sharing at the What's for Dinner Link up!